Great piece! Love the button detail. I love this bracelet! paulamaye@aol.com Thanks for the opportunity! This is gorgeous. It is so generous of you to do a giveaway and so exciting to enter!! If one of those folks who doesn't want your dragon wins, pretend otherwise and send it my way!!! hahaha - funny, Gale! I did remove your email post since you're right - it's already linked. Good luck! I must have this bracelet lol. Your designs are so fabulous and amazing. Love all of them!!!! I would love another one! If I win can I get it in black and silver? Ohhh!! Me too. I really like the black and silver. hee, hee! Beautiful bracelet - I would love to win! Ok - I keep saying that this would be a great gift for my husband but I doubt I'd let him have it! It would be all mine! That bracelet is soooo nice! Dear Sherry, You do such wonderful work. I shared the giveaway on my jewelry page-@Rising Designs on FB. I'd love if it if you just give me a little "LIKE". WOW! Who wouldn't want that bracelet?? It's gorgeous! Such a generous thing to do. Would be thrilled to own a similar one. Thanks so much! I dont think I am eligible as I live in India. Macrame is something which is not common in this part of world. I just did all the rafflecopter stuff so i hope i am entered- it is beautiful! I am going to try and "pin it" also. I checked and it worked on Pinterest. Good thinking! Thank you for sharing! Would love to win such a gorgeous bracelet! I'd be tickled to death to win the dragon bracelet! Thanks so much for the opportunity to enter. It definetely sounds like a deal! I'm in. Ooh what a great giveaway, I love dragons and macrame and beads so this is a great opportunity, thank you. What a wonderful bracelet, I would love to win it! That is one stunning bracelet! Amazing piece, I hope lady luck favors me!! Amazing blend of colors - love it! Deal :D I love your work! Your work is exquisite, and Matte Metallic Khaki Iris is my favorite bead finish. Beautiful work! I strive to make things as beautiful! This is a gorgeous bracelet! And the focal bead...oh my beautiful. This is a very good giveaway, keeping my fingers crossed. Just beautiful work. The dragon is fantastic and the bead work is delightful. Great combination of color. your work is lovely, I have tried and failed at macrame' can't seem to get my overs and unders kept in order. Your Dragon Bracelet is fab! I think I put that I shared it on my facebook page, but I think I actually shared it in my group page: Etsy/Artfire United. I had the same thought , not for a kit for this excact peice , but maybe a soup with the dragon pendent included ... simpley because i dont where braclets often cuz i find myself having to take them off then put them on , etc ..... but it dosent mean i dont ADORE this because like you said it's Absolutely gourgeous !!!!!! and i'd be lucky to own it !! If you win, you have to option of asking for beads instead of the finished piece and I sure could do these beads & that focal:) I don't have a pattern for it, though, so it would be a design-it-yourself thing. Which would be really awesome to see what you guys would come up with using the same components! Entered! What a clever form! Rafflecopter - lets even blogging newbies like myself run a giveaway:) Love technology! I love rafflecopter. It does it all for you and it's free. Entered too. Love the bracelet! Gorgeous entered & shared on my FB Page. Good Luck Everyone. I shared this on my FB page, too. I would looooove to win this bracelet! Ever since my son and I have watched "How to Train Your Dragon", I have a thing for dragons. And what a beautiful bracelet!!! I love your designs - you are very talented at macrame. Thanks for the chance to win! Ooooh! Gorgeous Dragon cuff! What beautiful work! I'd love to adorn my wrist with this fantastic piece! If we don't win, can we buy this bracelet? Yep:) I do offer them for sale in my Etsy shop - I just list them every now and again or I don't get anything else done:) You can always message me over there & order one, though. I shared with friends. We would all love one of these. Beautiful!! Thanks so much for the chance to win this great bracelet!!! Holy Moly...that is beautiful...I would so so so love to learn to do this. It was so popular when I was in HS, but I never wanted to do something like this back then, but now...oh baby...I want to learn. Hope I win...I just love it. 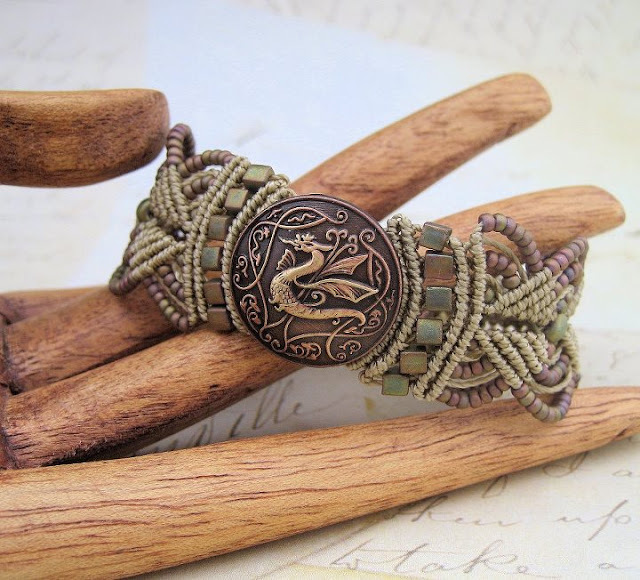 Beautiful bracelet, I love dragons.......wish I knew how to do macrame. Love the bracelet. I've never seen a focal like that. Please enter me in your giveaway. Love all your macrame knot jewelries. It brought back memories. I experimented with knots years ago before I got hooked with wire wrapping. It would be awesome to have one of your work. I really like that copper dragon button! I absolutely love this and haven't seen anything like it anywhere. Totally awesome! Celticprincess1998@yahoo.com. Thank you! I don't usuallt enter giveaways! But I sure did enter this one! It's so unique and so gorgeous! What a little work of art! The finest piece i've ever seen i feel power coming too me just from looking at the bracelet i don't need the bracelet I Want the bracelet i'm getting the bracelet i can feel it. Gorgeous bracelet and love your blog! I can' believe you would give this away. It's so beautiful. Fantastic bracelet. Had to enter. I would love to be the winner of this Amazingly Beautiful bracelet! hope to win. send it my way, i will treasure it for sure! Entered and keeping my fingers crossed! It's so me! Nice detail in the macrame. How many entries for giving you a sale? (jk!) My mom just bought the Navaho wave bracelet, I sent her your etsy, your things are so gorgeous! Absolutely lovely... I would love to learn micro macrame... I love this bracelet - thanks for the opportunity to share your good work and possibly win. My son Shane is an artist, but all his life he has collected dragon sculptures, etc., plus he has drawn and continues to draw/paint, etc. some amazing dragons! Your creations and artistry are outstanding! What a beautiful bracelet! Definitely worth entering. This is just gorgeous! Thank you for the chance! Entered! That is beautiful! I wold love to win it - thank you. I have entered. rmar261783@aol.com. Love the way you macremé! Oh, I can't believe I was too late!!! Love this piece and want to learn how to do micro. AND THE WINNER IS.... LISA MASTERS! Congratulations!! !